HAPPY NEW YEAR EVERYONE! Hope you all had a good one,we certainly did and are currently paying the price. micheals one and only hero. Against all the odds we made it back in one piece to start our christmas preperations. These began at big c the ultimate supermarket which sells everything, beats tesco any day. have had a hissy fit. Managed to purchase a chicken complete with head, feet and internal organs much to beccas horror, the girls decided it was michaels job to deal with this. Most successful purchase of the day was our santa hats which we wore despite the boiling heat, as if we didnt already stand out enough! in ellens house) gut and then hack the bird to pieces with a meat cleaver. she was disgusted by his girly screams as he attempted to decapitate it and insisted on taking over. homesick was great to catch up and feel at least a part of the family christmas at home. got swarmed at the door by a group of them wanting a kiss and money. the terror on his face matched that of the monkey experience. deck, hoping the fresh air would help (it didnt). luckily a passing frenchman managed to catch her before she disappeared into the sea. difference from last thai island experience (no drug dens this time thank god). spent the afternoon sunbathing and catching up on sleep. The beach where we are staying is a loy quiter than haad rin (the party beach) but there is still some really nice beach bars where we have been spending our evenings sampling the food and sipping cocktails- not a bad life. News years eve day reminded us very much of home as it chucked it down all day. hannah and laura took this opporutinity to have a thai massage and they have the bruises to prove it! it's strange how something so painful can be so relaxing- although the toe cracking was maybe a step too far! New years eve was even better than expected , started the night off with a meal on the beach where we were given a lantern to write messages on and set off into the sky. there was disturbving numbers of drunk peaopl setting off their own fire works-quite a few went astray into the trees and bungalows but we lived to tell the tale. 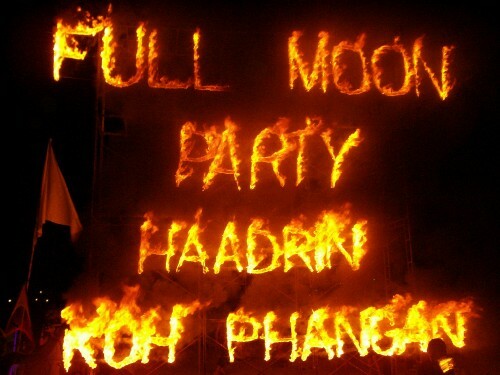 we got a taxi to haad rin where the full moon party is for half 10- and we did quite literaly dance the night (and morning) away. we all agree its the best night out we've ever had - you can't beat the atmosphere of 30,000 people dancing on a beach in the moonlight. Had some very sentimental moments as we realised how totally happy we all were, without a worry in the world. we havre some very funny tales and memories from that night. one of the few we can share is michaels gymnastic cartwheel competition/dance off and watching the extremly drunk guys weeing in the sea and then falling over into it. We were there dancing until the sun came up - didnt leave until 8 a.m.. as the sun came up a storm came in- so we were dancing in the rain aswell. we looked a bit of a sight with our flourescent body paint which seemed like a good idea at the time! Today we've unsurpisingly not done very much- the prospect of packing is not one we are excited about. We leave tomorrow morning to go our seperate ways- laura and hannah to malaysia for the week and becca and micheal to bangkok to head home. they will both be missed majorly and cannot wait to see them both again!